Originally, chewing gum was made from tree sap but today's commercial brands are loaded with harmful ingredients and chemicals. The modern day chewing gums are made of four major ingredients including synthetic rubber, plastic, sugar, and coloring (dye). Modern day gums are produced from synthetic polymers such as styrene-butadiene rubbers and polyvinyl acetate. The final product is composed of 60% sugar, 20% corn syrup, and only 20% actual gum material. 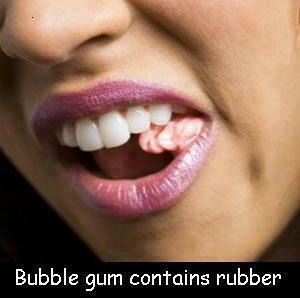 If you're chewing gum you are chewing rubber and plastic. Chewing gum is known as a harmless cultural tradition but it contains many properties that may be hazardous to our health. Today's chewing gums and bubble gums are predominantly sugar by volume. Seventy to eighty percent of most gums on the market today are sheer vehicles for sugar, the number one drug on the planet. Just as cigarettes are a conveyor for the addictive drug "nicotine", so is gum for sugar.